The Internet of Things (IoT) connects the physical world of people, devices and sensors and the digital world of data. 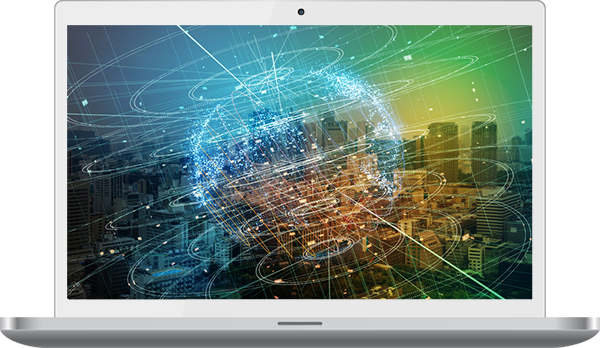 Sensors in mobile and smart devices, machines and networks produce high-velocity data that needs to be ingested, analyzed and acted upon in real time so all potential business value can be extracted from that data. VoltDB is the only database that combines the fast data ingestion, real-time analytics, and transactional decision-making that are critical to enabling applications to deliver on the promise of the IoT. Ingest: High-speed data transfer, in-memory performance and horizontal scalability combine to enable consumption of high-velocity inbound data feeds. Analyze: Real-time access to applications and querying engines enable analytic queries on the stream of inbound data that allow creation of rules engines to process business logic. Act: The ability to trigger events and make decisions based on the inbound stream and known historical context – thresholds, rules, policy-processing events and more – and then to export accumulated, filtered, enriched or augmented data to downstream systems and long-term analytics stores. 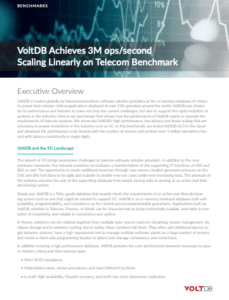 In this benchmark, we tested VoltDB v8.3 in the cloud and observed the performance scale linearly with the number of servers and achieved over 3 million transactions/second with latency consistently in single digits. Smart Energy solutions allow utilities to monitor, in real time, the current operational state of the generation, transmission, and distribution network and they provide the ability to automatically respond to changing conditions in those systems as quickly as possible. The goal is greater visibility, control and efficiency of the generation of power. Utilities collect data at frequent intervals, analyze it, and make decisions in real-time to reduce consumption and improve grid management. Utilities need to acquire quality data from smart meters. This means systems need to process raw meter data and analyze it, provide gap analysis, detect spikes, and fill in estimated data where required. Batch systems are too slow as the data is analyzed at the time of ingestion. What’s required is a transactional database architected to handle fast data’s speed and volume while delivering real-time analytics. VoltDB’s high-velocity data ingestion engine enables utilities to generate insights from streams of incoming data on a per-event basis. Leveraging smart energy data, VoltDB can alert utilities if their usage is trending toward exceeding their forecasted energy budget. Additionally, reporting meters can be automatically compared to identify meters that did not provide a current status. If a meter misses a defined number of consecutive reporting intervals, a technician can be automatically assigned to fix or replace it. VoltDB enables utilities to help consumers and commercial customers reduce energy costs while more efficiently using energy resources. Energy consumption data can be captured in real-time and analyzed rapidly to enable real-time decisions. Smart Meters allow utilities to capture energy consumption in real-time, but traditional database systems are too slow to ingest metering data, analyze it rapidly, and enable real-time decisions. VoltDB is a transactional database architected to handle fast data speeds and volume while delivering real-time analytics. The Smart home is being built on a network of connected devices that can interact with everything from major appliances to heating and home security systems. New applications built on these devices, such as innovative home security services, require fast data processing for actionable intelligence to provide homeowners with peace of mind. Providers of smart home security solutions offer security and peace of mind through proactive deterrence. Delivering on this promise requires the ability to process sensor data fast enough to detect and help prevent break-ins. Sensors attached to doors, windows, and personal belongings capture and send data, and then alert customers at the first sign of an attempted break-in. But with dozens of sensors in each house, and thousands to millions of houses sending data, the challenge is ingesting and intelligently processing data in real time. Response time is critical. VoltDB’s distributed database infrastructure and ability to perform streaming analytics with transactions on live streams of data support smart home security application requirements. VoltDB is elastically scalable, able to keep pace with variable workloads, is cloud-based, and supports real-time decision making, which relies on both streaming analytics and transactions. VoltDB’s familiar relational SQL model and ability to support highly interactive security services, while managing state and executing per-event transactions, offer an ideal solution for providers of smart home security systems. Providers of smart home security systems choose VoltDB for its scalability and high-performance streaming analytics with real-time decision-making capability. VoltDB’s ability to analyze data streaming from a security system’s sensors in real time ensures accuracy and puts security back into the user’s hands. Just as a home becomes smarter with intelligent connected devices, so too can enterprises become much more efficient with sensor-enabled equipment. The factory floor is already heavily populated with sensors, is connected, and is monitored — but other parts of business will also benefit from regular health monitoring. Think about your data center — wouldn’t life for you (and your IT department) be much easier if your company’s computer equipment never failed? That might be impossible, but it is possible to sense when equipment is likely to fail, and to proactively service it before such a failure does occur. One VoltDB customer does just this. They manufacture high-performance storage arrays, and have included within those arrays all types of sensors to monitor various environmental and performance parameters for the components within the array. They constantly monitor the sensor readings from all of their customers’ data storage equipment, and use VoltDB to compare the real-time readings to predictive maintenance models they’ve built using historical data. Service technicians are deployed to replace faulty components before they fail, saving their customers from unexpected downtime and thus dramatically elevating their equipment’s reliability and also their customer satisfaction ratings. VoltDB’s efficient architecture and scale-out design allow data from hundreds of thousands to millions of sensors to be monitored and acted upon in real-time using a single VoltDB cluster. VoltDB’s ability to act instantaneously on real-time streaming sensor data, and to seamlessly integrate with big data platforms like data warehouses and Hadoop to access accurate predictive analytical models built using long-term historical data, can make it seem like a company’s computer equipment never fails.